BERGUITTA Intense Tropical Cyclone is the third System of Summer Season 2017-18 of South Indian Ocean, after AVA and IRVIN. As a Moderate Tropical Storm, it threatened Rodrigues Island 13-15 January 2018. However, BERGUITTA showered graciously (52-110 mm) the drought-stricken island, as 100% Perfectly Predicted since 09 January. It is also a Phenomenon which has formed according to a change in Weather Pattern of this zone. It is highly likely to cruise along the landmass of Mauritius as from Wednesday 17 January. The Mauritius Meteorological Services (MMS) has issued, at 4.30 pm Monday 15 January, Cyclone Warning Class I for Mauritius, after waiving Class III for Rodrigues. The Impacts are forecast to cause lots of material damages as Mauritius has been soaked by Heavy Rains since the New Year 2018. Besides, the Antarctic Circumpolar Current (ACC) is very Robust since a few days. BERGUITTA being a ‘Small-Size-System’ will, no doubt, move as from Wednesday 17 January, according to the tremendous and enhanced phase of the ACC-World Most Powerful Wind. It is Predicted to pass near the closest point at Trou-D’Eau-Douce in the East of Mauritius. Reunion Island too is under its ‘agenda’. DOOMSDAY? PKANHYE. 10.11 pm MONDAY 15 JANUARY 2018. Weather in the Southern Hemisphere of Season 2017-2018 continues to evolve in different pattern and in a very dynamic way, as mentioned in previous articles. Rainfalls and Cyclonic Systems are already causing disasters in this zone. After Tropical Cyclone AVA made landfall in Madagascar 03-05 January 2018, Tropical Cyclone BERGUITTA threatened Rodrigues Island 13-15 January. Cyclone IRVIN (06-08 January 2018), luckily, tracked in the open Southern Indian Ocean, without meeting any land mass. However, Reunion and Mauritius have been showered Heavily during all these episodes. On one hand, while Tropical Cyclone BERGUITTA continues to intensify and to appear a serious menace to Mauritius, on the other side a Tropical Disturbance is in formation in the Mozambique Channel. This is the ‘Hot Spot’ of the South-West Indian Ocean Basin. International Centres: the Joint Typhoon Warning Center (JTWC) has named it 99S INVEST; Météo-France (MF) has named it as 4-2017-2018. In case of intensification, it may be named CEBILE Moderate Tropical Storm. Besides, it resembles DINEO after CARLOS in Season 2016-2017. Is it DOOMSDAY? The Southern Hemisphere of the Indian Ocean appears, no doubt, to develop some particular Dynamism in terms of Cyclones and Rainfalls. IRVIN-Severe Tropical Cyclone formed in the West of Cocos Island. It was named, by Australian Bureau of Meteorology (ABOM), on 06 January 2018. IRVIN is still influencing Eastern Indian Ocean and a Fujiwhara Effect is expected with the weakening Tropical Cyclone AVA. Another Cyclone is highly probable, for Western Australia. Joint Typhoon Warning Center (JTWC) has identified Tropical Disturbance 96S INVEST to intensify within 24 hours. The Australian Bureau of Meteorology (ABOM) indicates, as at 5.52 pm (11.52 am Mtian-Time), 09 January 2018, that ‘Tropical Low’ is expected to develop into a Severe Tropical Cyclone almost at the same pace. Rodrigues- Predicted Heavy Rainfalls by 13 January 2018. The Summer Season 2017-2018 for South Indian Ocean has undergone a Dynamic Change in Weather Patterns, as compared to the previous years. Rodrigues Island, located around Latitude 220 South and Longitude 630 East, in under the impacts of the currently prevailing Cyclones AVA and IRVIN-the First Twin Weather Systems of this zone. Moreover, the Inter Tropical Convergence Zone (ITCZ), the Madden Julian Oscillation (MJO), the South-East Trade Winds (SETW) and the Robust Antarctic Circumpolar Current (ACC) are contributing for the occurrence of HEAVY RAINFALLS, particularly on the drought-stricken Rodrigues. It is a Phenomenal Zone wherein all these systems undergo an Atmospheric Fusion. As a result, Extreme Weather Events take place. Besides, Reunion Island has already broken, yesterday 09 January 2018, the World Record (690 mm) in terms of Rainfalls in 6 hours with 737.2 mm of precipitations. This is Predicted, highly likely, to happen by 13 January 2018. 2nd Cyclone for South Indian Ocean 2017-2018. The Summer Season 2017-2018 for South Indian Ocean appears to develop a particular dynamism in terms of Cyclones and Rains. While Tropical Cyclone AVA is making landfall across Madagascar, bands of Rain Clouds are following it, causing additional Disasters. The Australia Bureau of Meteorology (ABOM) has named another System as IRVIN Tropical Cyclone this morning. This Cyclone is moving West South-West at 20 kph. It represents a serious threat to Rodrigues, Mauritius and Reunion which have, during current week, been under floods associated with Tropical Cyclone AVA. NB: Météo-France-Reunion (MFR) and Joint Typhoon Warning Center (JTWC have been consistently signaling Cyclogenesis in this zone. The Summer Season 2017-2018 for South Indian Ocean started officially from 01 November 2017. A Rainy episode occurred 14-17 November thereon. One Sub-Tropical Disturbance evolved in South of Madagascar 09-12 November 2017 and a second one on 17 November. Another Rainy period lasted from 23 to24 December 2017. Tropical Disturbance 94S INVEST formed on 29 December in the South-East of Diego Garcia moving almost West South-West after a slow intensification. Local, regional and international Forecasters experienced a lot of uncertainty regarding its dissipation or upgrading. Finally, it was named, at 10.00 am today 03 January 2018, by Météo-Madagascar as AVA Moderate Tropical Storm. It is noteworthy to state that the Pattern of Cyclogenesis for this Season seems to have changed as compared to that of 2016-2017 and of previous years. The Weather Systems, forming and evolving in the Southern Indian Ocean Basin, have undergone significant changes. The Patterns of previous years do not seem to be consistent. Meteorologists, Forecasters and Scientists are obliged to do their homework competently. 01 November marks, officially, the beginning of Summer Season in the South-West Indian Ocean. However, as at date, Cyclogenesis have been signalled rather timidly, at local, regional and international levels. Nevertheless, the ‘Summer Outlook 2016-17’ released by KANHYE.COM is a Record in Prediction of Weather on Medium Term basis. Refer to article. PKANHYE 11.25 am Saturday 30 December 2017. NOAA Climate Prediction Center has been indicating Cyclogenesis and Rainfall in the Bay of Bengal since 01 November until 28 November 2017. It was valid although Very Severe Cyclonic Storm OCKHI tracked towards the Arabian Sea. Refer to the pictures. On the other hand, the South-West Indian Monsoon is triggering Heavy Rainfalls and Flash Floods in which more than 70 people have been reported dead during this week and economic, agricultural and residential sectors have also been seriously affected. The rapid evolution, since 25 May 2017, of 94 B INVEST into Severe Cyclonic Storm MORA and its eventual dissipation, is no doubt Phenomenal. It is also a matter of fact that it has, in combination with the South-West Monsoon, caused disastrous impacts all along its track until making landfall in Bangladesh. The Early Warning Systems seem not to be Perfect. UN and Media reports indicate considerable losses of lives, damage to property and economic loss, coupled with Humanitarian Crisis. MORA Cyclonic Storm finally named. The South-West Monsoon Season of Asia seems to be trapping a Tropical Disturbance which is evolving since a few days in the Bay of Bengal. The Joint Typhoon Warning Center (JTWC) has named it as 94 B INVEST on 26 May 2017. However, the probability of Cyclone Development was forecast to be Low, as the System showed slow development. However, it has signalled some slight improvement today. UPLOADED: 5.00 pm SATURDAY 27 MAY 2017. Mauritius, specially the region of Port Louis, was struck by Thunderbolts during 9.00 to 9.30 pm on Wednesday 26 April 2017. The Cumulonimbus Clouds were visible during the flashes of Lightning and Thunder, but not a drop of Rain fell. The Climate and Weather Patterns in whole Indian Ocean appear to have changed. The Summer Season 2016-2017 for Southern Indian Ocean has already ended before 15 May, as mentioned in earlier article. In other words, Winter Season has started in 16 April 2017, as stated previously. WWW.KANHYE.COM has made another record in Weather Predictions for January to May 2017. See articles previously published. The Mauritius Meteorological Services (MMS) has released its 'Winter Outlook on 12 May 2017', based on its usual forecasts (although late). The South-West Monsoon of Asia has also started earlier than normal period-20 May. Various regions of India have been under Thunderstorms since 12 May 2017, accompanied by Rains. While Mumbai was showered with Light Rains, other places in the North-East saw significant Precipitations. Heavier showers are forecast for many other regions. in MYANMAR around Midnight on 16 APRIL 2017. 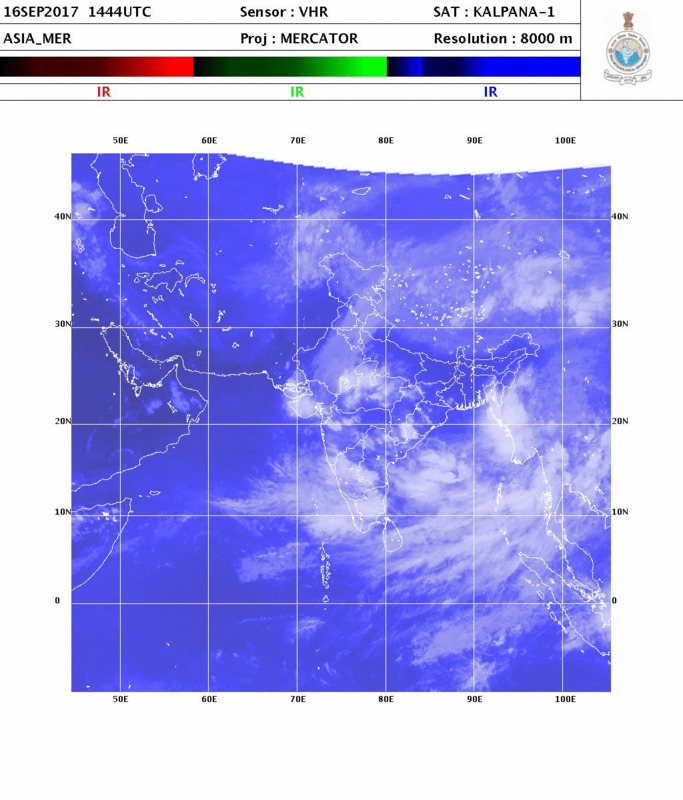 The Low Pressure located, on 15 April 2017, at Latitude 14.70 North and Longitude 90.50 East, approximately 564 Nautical Miles of Dhaka, Bangladesh, has intensified into a Deep Depression. At 1730 hrs on 15 April 2017, it was located at Latitude 14.3º N and Longitude 90.0ºE, about 340 km West North-West of Maya Bandar (Andaman & Nicobar Islands) and 680 km south-southwest of Kyaukpyu (Myanmar) has moved with a Rapid Speed of 28 kph towards the North-East of Bay of Bengal. Owing to its further intensification, it has been named today as MAARUTHA Cyclonic Storm and is tracking towards almost the same direction at 24 kph, for an eventual Landfall. According to India Meteorological Department (IMD), MAARUTHA ‘is likely to move northeastwards and cross Myanmar coast near Sandoway around mid-night of today, the 16 th April 2017’. CLICK HERE to verify with Myanmar Department of Meteorology and Hydrology. Or CLICK Animation icon here with NOAA or here with IMD. The outgoing Summer Season 2016-2017 of the Southern Indian Ocean has been remarkable with ‘Change in Climate and Weather Patterns’, as PREDICTED since 07-11 January 2017. The incoming Winter Season of 2017 seems to ring the ‘Alarum Bell’ with an early entry. Heavy Rainfalls have been recorded in Mauritius and Reunion Islands during this transitional period. The Atmospheric Conditions around the Mascarenes indicate a Wet Winter Season. (Watch Video below). Another 100% Perfect PREDICTION for South Indian Ocean. But, Incompetence of Mauritius Meteorological Services. “March, which is the peak of the South-West Indian Ocean Monsoon System, is Predicted to offer scenarios of Extreme Weather Conditions with Floods coupled with Disastrous Cyclones.” This abstract from the article published in this Website: ‘Summer Outlook 2016-2017- South Indian Ocean’ is another 100% Perfect PREDICTION made since 07-11 January 2017. Cyclone FERNANDO is already in formation in Central-South Indian Ocean. While Météo-France-Réunion, the Regional Specialized Meteorological Centre (RSMC) has been indicating Cyclone Genesis in the Monsoon Trough, the Joint Typhoon Warning Center (JTWC) has been upgrading to ‘HIGH’ for the System’. The Mauritius Meteorological Services (MMS) is still lingering and mentioning Tropical Depression. Besides, Observations of Clouds and of the Atmosphere around Mauritius confirm the PREDICTION of Extreme Weather Systems. The Climate and Weather Patterns in the Southern Indian Ocean are under an unprecedented Dynamism. After the two first Cyclones for year 2017-CARLOS (04-07 February 2017) and DINEO (13-15 February 2017), the zone around Madagascar and Mozambique Channel seems to be the same birthplace of ENAWO. On one side, Observations of the Atmosphere and of the Clouds from the Ground of Mauritius indicate the approach of another Cyclone and/or Flood Storm. While on the other hand, Météo-France-Réunion, the Regional Specialized Meteorological Centre (RSMC) of South Indian Ocean Basin, is indicating Cyclone Genesis in the Monsoon Trough (Twaleg de Mousson). Read more: Summer Outlook 2016-2017 South Indian Ocean, Prediction and Cyclone Names. (Watch Video below). The Climate and Weather Patterns in the Southern Indian Ocean have changed, as mentioned in Articles ‘Summer Outlook 2016-2017’, ‘FLOOD STORM-100% Perfect PREDICTION’ and ‘CARLOS Tropical Cyclone 04-07 February 2017’. Tropical Cyclone DINEO is another System which has taken birth in the zone of Mozambique Channel, as PREDICTED since 07-11 January 2017. CARLOS Severe Tropical Storm:100% Perfect Prediction- Poor Forecasts, Monitoring and Disaster Resilience. Summer Outlook 2016-2017 South Indian Ocean, Prediction and Cyclone Names. ABELA Cyclone of South Indian Ocean in Formation-Winter Phenomenon. Rodrigues Island- Lucky Escape from Unprecedented Thunderbolts Whole Night of 30 April 2016. Thunderbolts Trigger Heavy Rain and Panic in Mauritius-Loopholes of Local Meteorological Services. FANTALA Cyclone- Phenomenal Record Breaker Visiting Madagascar and Surrounding Islands Scientific Loopholes, But Best Prediction. 2ND Flood Storm for Season 2015-2016 in South Indian Ocean-Phenomenal System. EX-SPEAKER ABDOOL RAZACK PEEROO AND DEADLY FLASH FLOOD OF 30 MARCH 2013. DEADLY FLASH FLOOD OF SATURDAY 30 MARCH 2013. DEADLY FLOOD OF WEDNESDAY 26 MARCH 2008. FOBANE CYCLONE- ANOTHER PHENOMENON FOR SEASON 2013-2014. COLIN 4th TROPICAL CYCLONE 2013-2014. WEATHER FORECAST FOR MAURITIUS-NOVEMBER 2013. PHENOMENAL BRANSBY- First Sub-Tropical Depression for Summer Season 2016-2017-South Indian Ocean.